Great uptake of the Challenge! The long and intense preparation period including talking to the teachers, hosting the workshops, getting the Arduino Esplora boards, assigning the school grants and deploying the course material has finally come to an end! On 12 Oct we raised the curtain and let the students and teachers into our virtual community to tackle the activities proposed in the challenge. And the response has been fantastic. In the first week of the challenge we already have more than 160 classes signed up and we had a very busy week with more than 4000 user sessions all over Australia. 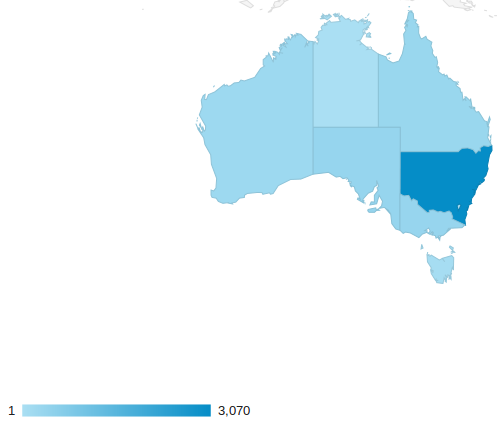 Number of user sessions in Australia in the first week of the Challenge! The whole Madmaker team is thrilled with this level of participation. If you want to share your experience in social media, use the handle #madmakerSTEM. Newer PostMadMaker 2016 Challenge Date Announced! Older PostThe Challenge Has Started!